We have often joked how I was surprised the day I got married when the Rabbi, who happened to be my brother in law, asked me if I would agree to divorce my Wife. I guess I should have taken my own advice and read the papers, in this case the Ketubah (Jewish marriage contract), in advance. Not that I would not have signed it. I would have also liked one suitable for framing as I like the blending of Jewish ritual and art. It has taken me 37 years but I finally got around to reading it again. The Ketubah has 22 lines of which 7 deal with divorce. It says, “And both together agreed that if this marriage shall ever be dissolved under civil laws, then either Husband or Wife may invoke the authority of the Beth Din of the Rabbical Assembly and the Jewish Theological Seminary of America or it duly authorized representatives, to decide what action by either spouse is then appropriate under Jewish matrimonial law; and if either spouse shall fail to honor the demand of the other or to carry out the decision of the Beth Din or its representatives then the other spouse may invoke any and all remedies available in civil law and equity to enforce compliance with the Beth Din’s decisions and this solemn obligation.” This is the famous “Lieberman Clause” named after Saul Lieberman, a professor at the Jewish Theological Seminary. The “Lieberman Clause” is necessary because only Jewish men can agree to a religious divorce (known as a Get). In order to avoid men using granting the divorce as a weapon in a civil divorce, the Husband agrees in advance to a Jewish Divorce. See my blogs on Religious Marriage and Divorce on March 10, 2008 and LA Law and Divorce on June 26, 2010. The rest of our Ketubah deals with declarations of how we will behave in the marriage. I found it very sexist. It is based on the Torah. The only common declaration is that we will love each other. My Wife must fulfill all the duties incumbent upon a Jewish Wife. I must protect and support her. Fortunately, the content of Ketubahs have greatly changed since we were married. 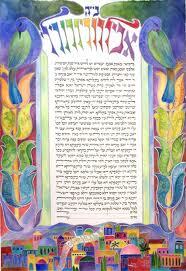 If you Google Ketubah, you will find a great deal of interesting material. Our marriage license was mysteriously filed two years late but that is another story. However, before the license was filed late, we needed proof of marriage to change a passport name and our Ketubah was filed instead. It may be the only Ketubah on file in Connecticut.